Concentré Pixelist: intensifies the brightness of the colouring. 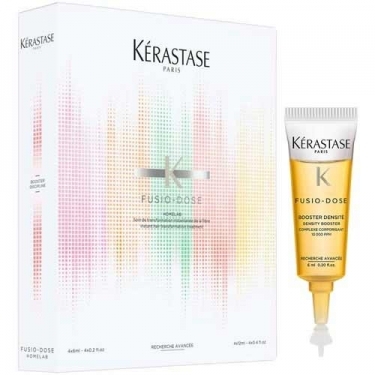 DESCRIPTION: Fusio-Dose Homelab Densité from Kérastase is a treatment in which the booster is mixed with concentrates, four powerful features that offer multiple combinations for a personalized result and instant effectiveness. Densité is a booster with a complex that improves the body for greater density. The fibber becomes denser. The hair gets more body. The hair is deeply nourished and the fibbers becomes immediately denser. The hair is deeply repaired and the fibber becomes denser. The brightness of the hair is intensified and the fibber immediately becomes denser. Based on the diagnosis select the active ingredients (ampoule concentré + booster). Open the ampoule concentré and mix the booster by shaking it well. This cocktail should be sprayed on washed hair after removing the shampoo and the water excess with a towel. Massage well and leave it to act for a few minutes. Rinse. You can then apply the mask for a more complete effect. 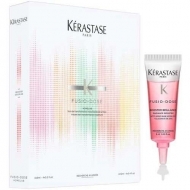 The micro diffusion guarantees an effective and deep application. The result is an immediate transformation of your hair fibber.